Justin is first and foremost a problem solver, a passion that started during his undergraduate studies. His background in economics provides him a way of thinking about things most lawyers do not possess. He strives to help his clients see the big picture, weigh the risks and advantages of litigation, and come up with cost effective resolutions. His goal is to put his clients in the best position before, during and after his services are no longer needed. 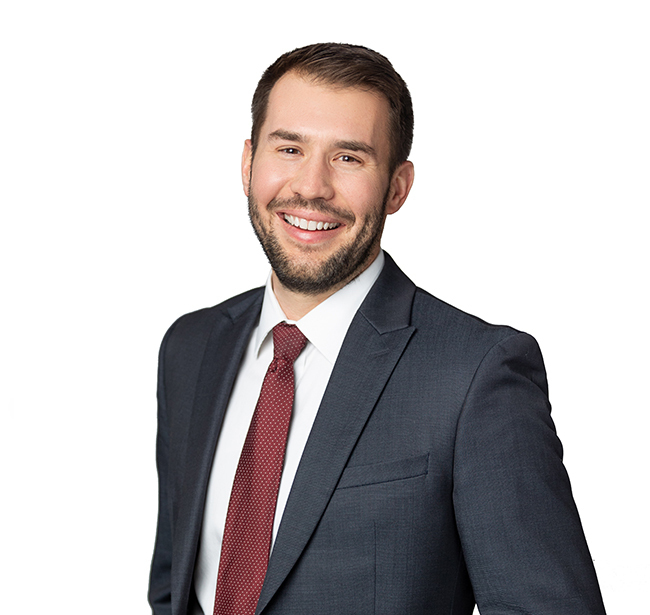 As a member of the firm’s Commercial Litigation Practice Group, Justin represents business owners, landlords, employers, trustees and fiduciaries in a wide variety of industries including, real estate, construction, manufacturing, financial services, trust and estate, and employment. Many of his clients face breach of contract, errors and omissions, breach of fiduciary duty, negligence and nonpayment issues. Outside the office, you can find Justin outdoors with his wife and two small boys, Patrick and William, or sharpening his golf game. Represented contractor at bench trial against claims made by equipment supplier for failure to pay rent, damage to equipment interest and reimbursement for attorney fees. At trial, the judge awarded only 10% of what the equipment supplier had asked for, which was well below the last pre-trial offer. Represented tenant at bench trial against landlord who sought damages for failure to pay rent. At trial, the plaintiff received damages of less than 5% of the amount the landlord requested.